What’s Happening and Why Does It Matter? Mozambique, a country with a long history of military and political instability, faces ongoing economic and political uncertainty. Economically it continues to be profoundly impacted by the negative consequences of the so-called “hidden loans”. Politically, the sudden death of Afonso Dhlakama, leader of Resistência Nacional de Moçambique (RENAMO), and the emergence of what is being called “Islamic radicalism” in the northern part of the country cast doubt upon Mozambique’s prospects to live under full peace and stability. How to understand a Mozambique facing multiple external structural challenges? What can be expected from the country in terms of its longstanding battle for effective peace and national reconciliation? Can it effectively deal with the serious threat posed by Islamic radicalism? Yes or No, the reality is that present-day Mozambique is characterized by potentials for multi-centred crisis which may also lead to multi-centred violence (social uprisings, guerrilla war and Islamic insurgency). The saga of the hidden loans: a self-inflicted wound? Until the Wall Street Journal revealed hidden loans totalling roughly $2 billion in early 2016, Mozambique’s economy had experienced consistent growth. Since the country’s first multiparty elections in 1994, GDP had consistently risen at 7.4 percent per year. This growth rate was attributed to post-war neoliberal economic reforms and was considerably above its population growth rate of 2.5 percent, constituting one of the highest economic growth rates in Sub-Saharan Africa. However, this growth had marginal impact on the livelihoods of its population, as poverty levels remained high. 2017 estimates, for example, put 46.1 percent of an estimated population of 28.8 million people below the poverty line. Economic growth in Mozambique is highly dependent on the extractivist sector, a sector from which most of its population (rural poor working in small scale farming) is totally disconnected. Declining prices for traditional export commodities (e.g. coal), the persistent drought caused by El Niño, domestic political and military instability combined with significant drops in foreign direct invest led to an historic drop in average growth to only 3.8 percent in 2016. That said, a sharp increase is projected for 2018 (5.3 percent). Coming from external debts equalling 60% of national GDP in the mid-1980s, in 2001 Mozambique qualified for $4.3 billion of debt cancelation under the Heavily Indebted Poor Countries (HIPC) initiative,. In 2005, a further $2 billion was cancelled under the Multilateral Debt Relief initiative, resulting in government debt payments falling to just 1% of state revenues by 2007. In recognition of this “economic success”, Maputo hosted the International Monetary Fund (IMF)’s prestigious “Africa Rising Conference” on 29-30 May 2014. Addressing the conference participants, the IMF Managing Director commended Mozambique for what she called “impressive economic performance”. Yet only four years after the IMF meeting, hidden loans led to the unsustainability of Mozambique’s debt, which now stands at 112% of GDP (2018). The revelation of hidden state-guaranteed loans prompted the IMF to immediately suspend further loan payments to Mozambique. The G14 Group (a group of international contributors to the state budget) also suspended its payments to the country. The United States announced a review of its support to the country. Together, these donors provided about a quarter of the country’s state budget. This suspension was, as pointed by Christine Largarde, justified by signs of corruption. Facing enormous domestic and international pressure, the government of Mozambique responded, engaging the international audit company Kroll to complete an independent audit of the $2 billion with financial support from the Swedish Embassy. In August 2016, a parliamentary commission of enquiry was formed to investigate. The commission concluded that the country’s constitution had been violated, yet neglected to charge any specific individuals. The companies involved in the illegal loans are well known: Proindicus S.A, Empresa Moçambicana de Atum S.A (EMATUM) and Mozambique Asset Management S.A (MAM). These companies are officially said to have been created to provide Mozambique with the means to protect its sovereignty over its Exclusive Economic Zone (EEZ) as well as to explore natural resources within this economic zone. The credits for Proindicus were for acquiring monitoring and protection solutions for the country’s EEZ. EMATUM’s were for developing a home-grown and self-sustaining fishing industry, while MAM’s were for offering mobile maintenance and repair services to EMATUM and Proindicus vessels and others exploring oil and gas assets in the country. Those arranging these hidden loan agreements are also well-known: Credit Suisse International for Proindicus and EMATUM, and the Russian Investment Bank VTB Capital PLC for MAM. In conducting this audit, the Office of the Public Prosecutor of the Republic of Mozambique (PGR) sought to assess the existence of any irregularities or criminal offenses in the procurement contracts and operations of the Mozambican companies involved. The process leading to the audit’s completion revealed how weak and vulnerable to political manipulation Mozambique’s legal institutions are. Access to information was cited by the auditing company Kroll as the main obstacle to completing the audit. Although led by instructions from the country’s Office of the Public Prosecutor, some of the people involved refused to provide auditors with the information required, arguing it was “classified”. Nevertheless, among other important findings the audit was able to establish that $500 million of the EMATUM loan had gone missing. This amount was said to have been used for the purchase of maritime equipment which was never actually acquired. Yet long before the audit’s conclusion, the PGR identified violations of budgetary legislation and non-compliance with the country’s legal procedures in the government’s granting of guarantees to the three companies. These actions constitute criminal acts, namely, abuse of office or function. Three years after a criminal case was opened in 2015 and with the final audit report already in the hands of Mozambique’s legal authorities, no one has been charged. The complexity involved in investigating these loans and the fact that they require judiciary international cooperation are the reasons put forward by the PGR for its lack of progress. This is to some extent a valid argument – not only because these credit institutions are located abroad, but also because they were responsible for verifying compliance of domestic legislation by the Mozambican government before approving such loans. Meanwhile, it is has been reported that the affair constitutes a high-level corruption case implicating executive personnel in Mozambique’s secret service and the former and the current president, together with other important FRELIMO cadres. It is also believed that the real reason the case has been held back is its potential to cause serious internal divisions within the ruling FRELIMO. With local elections due on 10 October 2018 and general elections (legislative, presidential and provincials) due on 15 October 2019, this could have serious consequences on voters’ behaviour, especially in the urban areas. While the case seems to be stalled at the legal level, ordinary Mozambicans are already suffering from the socioeconomic impacts of the crisis. Inflation indicators have deteriorated rapidly. In November 2016 it reached an all-time high of 26.35 percent – food prices doubled, bank interest rates increased significantly affecting investment and consumption, investment rates in the economy fell about 30 percent, and imports fell 4.7 percent. More importantly, the government has stopped subsidizing bread and recently announced its intention to do the same with fuels. Some hospitals including the country’s largest one in Maputo have since been running with shortage of chemical reagents. It has also been reported that an increasing number of much needed small and medium enterprises have closed and sent their employees home. On 18 June 2016, a march against the country’s political and the economic situation organized in Maputo was met by a heavy police presence. A month before the demonstration, the President of the Ecologist Party Movement for Land, João Massango, was brutally attacked by “strangers” when trying to organize a similar march. Like most political cases, nobody has been charged. Did hopes for effective peace die with Dhlakama? Afonso Dhlakama died during a very crucial phase for the peace negotiations, directly led by him and Mozambican president Filipe Nyusi. Mozambique’s ongoing peace processed is comprised of two packages: decentralization and de-concentration, and re(integration) of RENAMO’s guerrilla into the Mozambican defence and security forces (military, police and secret services). Prior to Dhlakama’s death on 3 May 2018, an agreement was reached concerning the decentralization and de-concentration package, while the rest was still being discussed. 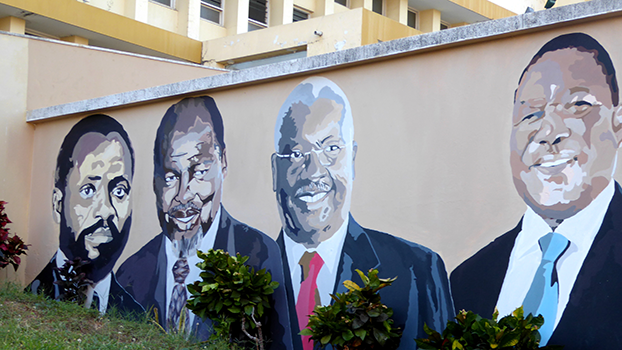 As a result of the agreement, Mozambique’s parliament unanimously approved a series of constitutional amendments on 23 May 2018 allowing for the indirect election of mayors, provincial governors and district administrators. This was perceived internally as a crucial gain for the country’s democracy. Ironically, Mozambique’s democracy may have indirectly “benefitted” from Dhlakama’s death in the sense that it made the current president into the sole leader of the whole peace process. President Nyusi now must continue peace negotiations by obtaining concessions inside its ruling party (which are usually hard to obtain when pushed for from outside), and with the opposition RENAMO (the proponent) ascribing the process very high chances of success. After the 2014 general election, RENAMO’s most ambitious demand was that of territorial autonomy. RENAMO demanded that the provinces in which it received a majority (Sofala, Manica, Tete, Nampula and Zambézia) be turned into autonomous territories under its rule. This demand, promptly rejected by the FRELIMO parliamentary majority on 30 April 2015, was based on RENAMO’s claim that the electoral process, which gave victory to the current President and the ruling party, was all but free, fair and transparent. For RENAMO, autonomous provinces would be the only way to resolve this electoral quarrel. After having survived two attempts on his life (perceived to have been conducted by government forces), Dhlakama retreated to the mountains of Gorongosa from where he led small-scale guerrilla attacks against government forces. After attempts by domestic and international peace facilitators failed, the two leaders decided to open direct negotiations. These gave birth to the recently approved parliamentary proposal regarding constitutional amendments. The military question remains to be decided. Under Protocol IV of the 1992 General Peace agreement (on military issues), it was agreed that the country should have a 30 thousand-strong army to which the government and RENAMO would each contribute 50 percent. The remaining troops not integrated into the country’s new army would be disarmed, demobilised and re-integrated into civilian life. However, it is said that an arrangement was made permitting RENAMO to maintain a small armed reserve force to provide security to its leadership. RENAMO also retained some of its military bases, particularly in the provinces of Nampula and Sofala. RENAMO’s current military power is understood to be made up of Dhlakama’s security personnel and others who, according to RENAMO, were unfairly demobilised by Mozambique’s government. The objective of RENAMO in this regard appears to be two-fold: 1) to fight for re-integration of its troops in all ranks of the country’s military and police force (including the secret service) which will also 2) give Mozambique a republican army not controlled by FRELIMO. Mozambique has conducted periodic multiparty elections since 1994 (the civil war ended in 1992). FRELIMO won all the general elections held so far (Joaquim Chissano in 1994 and 1999, Armando Guebuza in 2004 and 2009, and now Filipe Jacinto Nyusi in 2014), and most provincial and local elections as well. All these electoral processes have been highly contested by RENAMO. RENAMO’s contestations (against the fairness of the electoral processes) came to a head in 2012. After 20 years of apparent peace and stability, RENAMO returned to armed struggle to demand, among others things, a revision of the country’s electoral legislation which it claimed (as is generally accepted) favours the ruling FRELIMO. The electoral legislation was duly amended. Although a cease-fire agreement was signed between RENAMO and the Mozambican government on 25 August 2014, political instability continued to prevail and was further aggravated by the results of the 2014 general elections. Three days after the death of Dhlakama, RENAMO’s national political commission appointed lieutenant general Ossufo Momade national coordinator of the commission. Very little is known about the acting leader of RENAMO. However, he has extensive military experience. By appointing a historical member of its military wing to temporarily lead RENAMO, the party must be trying to exert pressure on the ruling FRELIMO to speed up the outstanding military issues. On the other hand, RENAMO must be trying to send a message that the death of Dhlakama does not spell the end of its military power, which has been the main and most effect tool in wresting political concession from the ruling FRELIMO. In fact, RENAMO’s national political commission deliberated with immediate effect and announced on 4 June 2018 that Ossufo Momade must reside in their military base in Gorongosa. The most important political concessions made by FRELIMO have been obtained through the use of violence. This is on face a discouraging factor as far as the full demilitarization of RENAMO is concerned, and for nonviolent democratic development in Mozambique more generally. However, despite having governed RENAMO autocratically and centralizing all major political and military decision making in his own hands, Dhlakama was able to build a coherent and concise hybrid force. While on one side, by military means, the guerrillas push for military and political issues from the bush (e.g. their re-integration into the national army and police, amendments to the electoral legislation, de-centralisation and de-concentration), the political wing on the other pushes for the very same agenda by political means in parliamentary sessions in Maputo, constituting a single voice . There is no doubt that the future of Mozambican peace depends on the political will of the country’s principal political forces, but especially on the ruling party. It is generally perceived that more political de-centralisation and de-concentration will expand the possibilities of other political forces (including some currently marginalized local elites) to access political and economic power in the country. In addition to this, it is also generally believed that the ruling party controls the military and the police force and uses them to suppress opposition to both the government and FRELIMO. The Islamic question: radicalism, banditry or emancipation? How to understand the Islamic question (or insurgency) in northern Mozambique? Is the country facing a local manifestation of global Islamic radicalism (which opposes Western-style democracy, democratic institutions such as the rule of law, individual liberties and mutual tolerance of different faiths and beliefs). defined by the West as Islamist terrorism? Is Mozambique threatened by a group of mere bandits who use Islam as a pretext to create chaos locally in order to profit from economic opportunities? Can the events on the ground also be seen as a particular form of local political emancipation of the local Muslim population which has suffered from centuries of marginalisation both by the processes of colonialism, independence and now by the process of development? I do not aim to answer any of the questions directly. However, I highlight the need to apply different analytical perspectives to the current Islamic question in Mozambique in order to better understand and properly explain it. Mozambique in its current form is a product of an Anglo-Portuguese treaty signed in May 1891. To understand the Islamic question and the emergence of Islamic radicalism in that particular region, one must also understand Mozambique’s pre-colonial history. Mozambique’s Islamic community is a product of contact between Arab traders and the local population which dates back to the fourth century, well before first contact with the Portuguese in 1498. Islam penetrated the coastal northern of Mozambique in the eight century, and since then it is said to have peacefully coexisted with local traditional cultural beliefs like witchcraft. Arab trading settlements along the coast and some islands already existed for several centuries before the arrival of the Portuguese, and local sultans had political control of the coast. Vast territories of the extreme north of the country once belonged to the Omani Sultanate and Omani Arabs controlled much of Indian Ocean trade. The Swahili language spoken by the local population borrowed a significant amount of words from Arabic. Data from the southern coast of Inhambane province even indicates that the southern Mozambican littoral was also part of the Indian Ocean trading networks operating within the sphere of the Swahili and Islamic economic and culture influence since at least the eighth century. It was only beginning in 1505 with the Portuguese occupation of Kilwa, the Island of Mozambique, Sofala and Cuma (later on Kilimani, Inhambane, Bazaruto Islands and others) that Swahili Muslims lost political control over the territory . According to some sources, initially no concerted effort was made by the Portuguese to interfere with local Muslim religious affairs, at least until after they took full control of the territory through military conquest and imposed an administrative colonial system at the beginning of the twentieth century . Following Mozambican independence in 1975, FRELIMO’s atheist Marxist-Leninist state ideology marginalised local Muslims, prompting some of them to give their support to RENAMO. In fact, today RENAMO enjoys significant support from the populations of coastal northern Mozambique, likely as a result of these historical dynamics. According to 2007 population statistics, 17.9 percent of Mozambique’s total population is Muslim. A plurality, however, is Roman Catholic (28.4%) . The vast majority of Mozambican Muslims are Sunni and consist primarily of indigenous Mozambicans (Indian and Pakistani descent) and a very small number of North African and Middle Eastern immigrants. This so far peaceful coexistence has led some to believe that due to the particular nature of Islam in Mozambique, the potential for radicalism was insignificant. At least until now. Accurate information concerning events on the ground is hard to obtain due to scarce official data, likely due to the potential these events have to threaten much-needed foreign direct investment in the country. Independent academic studies are also very limited and is not the product of thorough scholarly research with clear conclusions. Although attacks largely targeting local police stations began in October 2017, they reached horrendous proportions on 29 May 2018. Mozambicans and the world were confronted by extremely shocking videos on social media platforms showing beheaded bodies of ten people, including children. This brutal tactic may reveal how fast and deep the insurgents have radicalised. It is reported that the decapitated victims were people from the village of Monjane (Palma district). Monjane is close to the fragile border with Tanzania and not far from Palma, a small town soon to be transformed into the country’s new natural gas hub in the northern province of Cabo Delgado. Discoveries of huge quantities of offshore gas in the Rovuma Basin off Mozambique’s northern Cabo Delgado province promised to transform the country’s fortunes. The project aims to begin producing $1.5 billion worth of gas per year by 2022. The Italian company Ente Nazionale Idrocarburi S.p.A. (ENI) has secured a purchasing contract with British Petroleum (BP), which will buy gas for 20 years. It is also predicted that these discoveries will turn Mozambique into the world’s third-largest exporter of liquefied natural gas (LNG). While links between the gas project and the Islamic question are yet to be established, the group in that particular area may also have been attracted by the possibility of profiting from human trafficking when Palma becomes a major industrial complex in the near future. It is also important not to ignore that these investments may have triggered discontent among marginalized local elites since the major economic benefits are already being captured by the minority Makonde elite and others mainly based in the capital city of Maputo . On the other hand, it is important to ask whether or not the current violence is associated with forms of local reclamation of political and religious pre-colonial institutions which once dominated the territory and were suppressed by colonialism and independence. This hypothesis should not be ignored and requires scientific study. Locals call the group "Al-Shabaab", although they appear to have no direct links with the Somali group of the same name. The group’s real name is Ansar al-Sunna. which in English means “supporters of tradition”. The little information about the group available suggests that it arose in the northern districts of Cabo Delgado first as a religious group, but by 2015 began to radicalize further and include military cells. It calls for the implementation of Sharia law and refuses to recognise Mozambican law. Training camps are said to be located in the Cabo Delgado districts of Mocimboa da Praia, Macomia and Montepuez, where training is provided by former Mozambican police personnel. Nuro Adremane and Jafar Alawi are said to be the leaders of the group. In terms of composition, the group includes Mozambicans, Tanzanians and Somalis. Poaching, trafficking in ruby, timber and wood are said to be the group’s main source of income, which are mainly used to purchase military equipment and communication. Should Mozambique fail to get its economy back on track, social uprisings similar to or more violent than the riots it experienced in the capital city of Maputo and Matola (with minor incidence in Gaza and Manica Provinces) resulting in 13 deaths on 1 and 2 September 2010 can be expected. These riots followed the earlier 5 February 2008 riots over fuel and transport prices which took place in a similar context. Adding to this is the fact that 2018 is an election year in the country. FRELIMO’s usual difficulty to concede electoral defeat in some major urban municipalities combined with high levels of popular discontentment may create a perfect storm for post-electoral violence. To get its economy back on tract, apart from other economic measures, Mozambique must resume a normal relationship with its financial partners by legally resolving the hidden debts as soon as possible. Resuming its relationship with financial partners will also allow it to go back to the markets. The death of Dhlakama appears not to have caused any leadership vacuum within RENAMO thus far. What is not known, however, is whether the current leadership enjoys the same level of loyalty as Dhlakama did both in the military and political wings of the party. In this case, it is essential that the outstanding aspects hampering progress in the re-integration of RENAMO soldiers into the national army and police force be expedited before RENAMO’s soldiers lose hope and trust in their current leadership and revert back to violence. The Islamic question in Mozambique requires independent scientific and independent analysis. Meanwhile, if the current insurgency is not grasped as a regional threat and dealt with collectively with neighbouring countries, Mozambique may easily become a regional hub for radical Islamic terrorism, attracting insurgents from other places. It is urgent and vital that the Southern Africa Development Community (SADC) immediately begin to engage with the Mozambican government to help it resolve this dangerous threat to regional stability. Fredson G. Guilengue is the Regional Deputy Director at the Rosa Luxemburg Stiftung – Southern Africa (RLS), based in Johannesburg, South Africa. He has published extensively on Mozambican politics, from working papers to opinion articles in both English and Portuguese. His work also extends to areas such as land, agrarian issues and climate change. He holds a Master of Arts from the University of the Witwatersrand in South Africa. Guilengue, Fredson:A Dangerous Game: An all dominant ruling party and a rebellious opposition in MozambiqueRosa Luxemburg Stiftung Southern Africa. International Politics, Issue 05/2016. Guilengue, Fredson (2014). RENAMO: a three-sided coin? Rosa-Luxemburg-Stiftung Southern Africa, International Politics (3) pp:1-9. Newitt, M (1995) A History of Mozambique. London: C. Hurst & Co. (Publishers) Ltd.
 Bonete, L. Islam in northern Mozambique: A historical overview. History Compass, 2010. Zionist Christian (15.5%), Protestant 12.2% (includes Pentecostal 10.9% and Anglican 1.3%), other 6.7%, none 18.7%, unspecified 0.7%. The Makonde live throughout Tanzania and Mozambique and have a small presence in Kenya. The Makonde population in Tanzania was estimated in 2001 to be 1,140,000, and the 1997 census in Mozambique put the Makonde population in that country at 233,358, for a total estimate of 1,373,358. Mozambique’s current president belongs to this tribe and most of the country’s current elite are said to have come from or to have strong linkage with the tribe.